7 − 2 = Required Please enter the correct value. 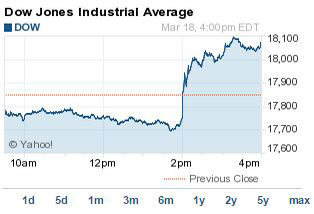 The DJIA Index surged 227 points Wednesday. The cause? The Federal Reserve indicated a slower pace for an expected interest rate hike this year. Commodities rallied on the news, with gold prices jumping nearly 2% and silver prices up almost 2.5%. The S&P 500 Volatility Index (VIX), the market's fear gauge, fell 10.79% on the day. What Moved the DJIA Index Today: In focus today was the conclusion of the Federal Open Market Committee meeting. The markets surged after Fed Chairwoman Janet Yellen signaled that central bankers will not increase interest rates until the nation sees an improvement in its jobs picture and inflation begins to rise. However, the Fed has not ruled out an interest-rate hike for June 2015. The central bank officially removed the word "patient" from its language, signaling that it is growing more prepared to move on interest rates at its discretion. Energy Surge: Crude oil prices rallied and the dollar declined after the Fed statement. The S&P energy index .SPNY jumped more than 2.5%. WTI crude, marked in New York City, jumped 3% to settle at more than $44 per barrel. Brent crude, priced in London, surged 5% to $56.18 per barrel. The price increases came despite news that U.S. crude inventories surged another 9.6 million barrels to a new record of 458.5 million barrels for the week of March 13, according to the Energy Information Administration. Case Dismissed: Shares of Herbalife Ltd. (NYSE: HLF) surged 12.5% on dismissal today of a lawsuit claiming the firm engaged in fraud and was a pyramid scheme. The weight-loss and nutritional products company has been under fire for two years from Bill Ackman and Pershing Square Capital Management. Ackman has been running a very public campaign against the firm and disclosed a $1 billion short position against HLF stock. Ackman and his fund are currently under investigation by the FBI over whether the fund and its manager manipulated HLF's stock price. BABA Blues: Shares of Alibaba stock were down marginally this afternoon on concerns about today's IPO lockup expiration. Alibaba Group Holding Ltd. (NYSE: BABA) saw more than 337 million additional shares float on the markets today. Institutions predominately hold the shares. In May, the company will experience its second lockup expiration when another 100 million shares, primarily owned by employees, will hit the markets. The stock is down roughly 18% year to date. Return Policy: In an effort to gain an advantage over its retail and online rivals, Target Corp. (NYSE: TGT) announced it will allow returns for up to a year on the store's private and exclusive brands. The decision is an extension of its previous 90-day return policy and is the first of its kind for a large-scale retailer. Rival Best Buy Co. Inc. (NYSE: BBY) allows customers to return anything within 15 days, while Wal-Mart Corp. (NYSE: WMT) has a 90-day in-store policy. TGT shares were flat on the day.